If he or she asks about the kind of daily maintenance you’re willing to put in, be realistic. If you don’t have 45 minutes to spend adding waves to your straight hair every morning, the wavy style is probably not the right one for you. 2. Bring a photo, but be realistic. Yes, it’s helpful for you to bring a photo or photos of your ideal cut or style, but make sure you choose one of someone with similar hair color and texture to yours. If you have fine, straight hair, don’t bring in a photo of voluminous curls. It’s also a good idea to bring in photos of what you DON’T like. You can start a Pinterest board, too! 3. Make sure your stylist is listening to you. A good stylist will repeat back to you what they’ve heard. Don’t bury yourself in your smartphone or tablet. Pay attention to what they are doing, and if you aren’t getting what you want or aren’t sure about what they are doing, stop them and talk about it. 4. If you don’t know what you want, tell them what you are like. 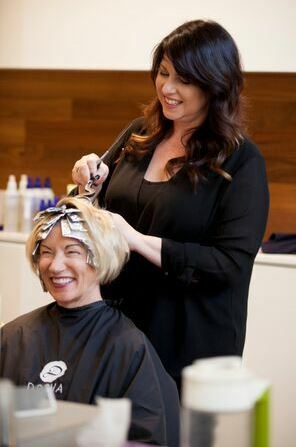 Tell your stylist about your lifestyle, your hair’s personality and quirks and your personal style preferences. If you need to be able to pull it all back in a ponytail at the gym, let them know. Are you afraid of having “mom hair” or having a style that’s frankly too young for you? Express yourself clearly. 5. Use very clear language. Thanks to social media, it’s fairly easy to find a plethora of reviews and recommendations about different hair salons in Portland as well as specific hair stylists. But nothing beats sitting down with a stylist for a consultation before you take the leap, and most salons are happy to schedule a 15-minute consultation before you book the haircut. Dosha Salon Spa is one of the top hair salons in Portland OR. You can see our work on our website, too.